Roxborough Residence | Williamson Williamson Inc. This renovation and addition was for a family who endeavoured to find a home that would exist seamlessly in a traditional neighborhood, yet exude a decidedly modern presence. They asked for a study of contrasts, not only oppositions in style and form, but also in the color palette, citing a love for the contrast of dark against light. 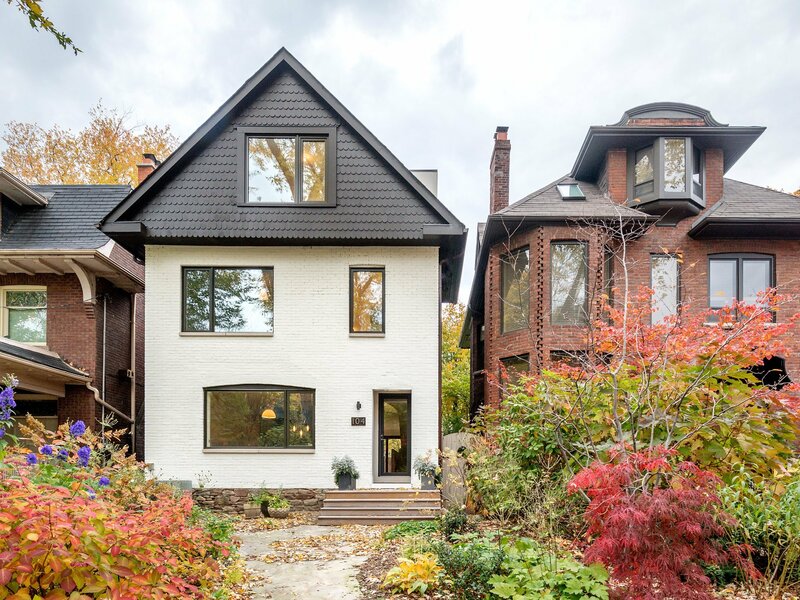 The existing home was a poorly renovated residence in a vibrant and handsome Toronto neighborhood. Beginning at the front elevation, every effort was made to produce open and airy family-oriented spaces out of what was previously a cluster of small and awkward rooms. By removing the deep covered porch and opening the entry and living room to dappled southern light, the front rooms that were once dark now embody the fresh simplicity of the painted white facade. The new arrangement of enlarged rooms required a relocated main stair to not only provide light to the center spaces, but to serve as the hinge for the Janus-faced project. 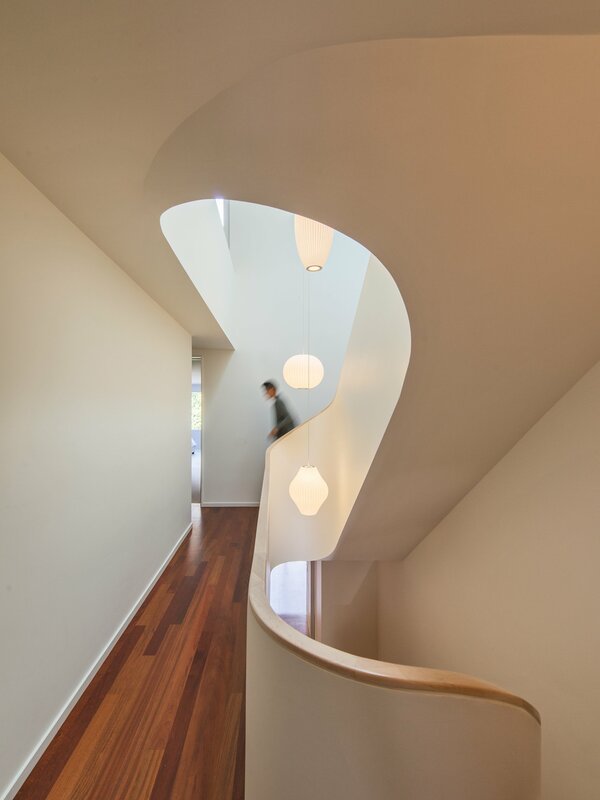 The center-piece curved stair, which carves a substantial space through the house from the basement to the third floor, operates as an extension of the large skylight above. 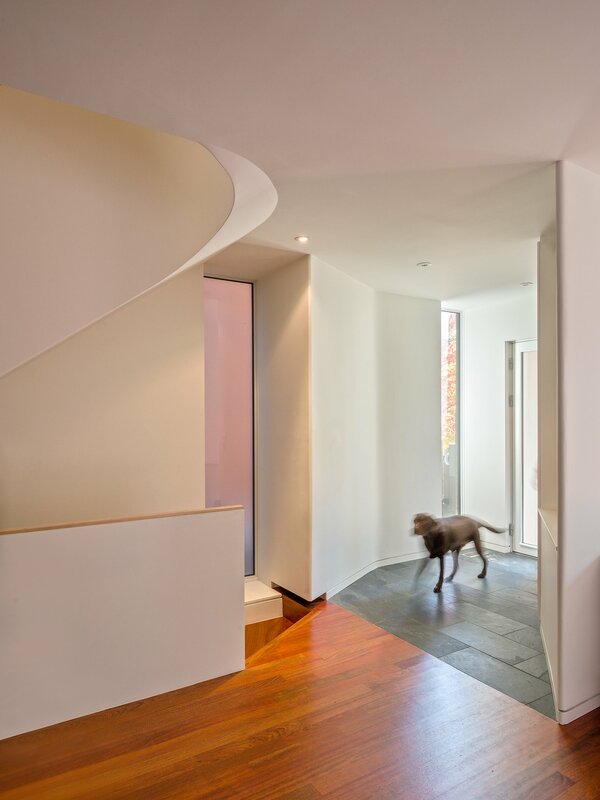 By funneling light through the center of the house this generous space, in a fairly narrow 7.3m wide lot, becomes a ‘vertical room’ in the house, growing in width as it rises to the third floor. The space allows not only light and air to vent through the operable skylights, but visual connections emerge between spaces on adjacent floors. 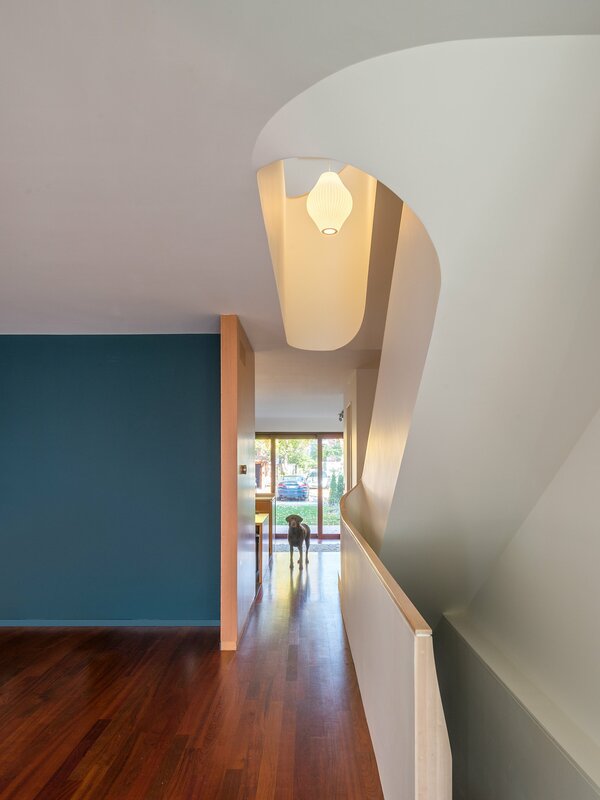 The stair’s thin, 5 cm balustrade was built-up of cantilevered sheets of flexible plywood that were laminated on site and sheathed in drywall. 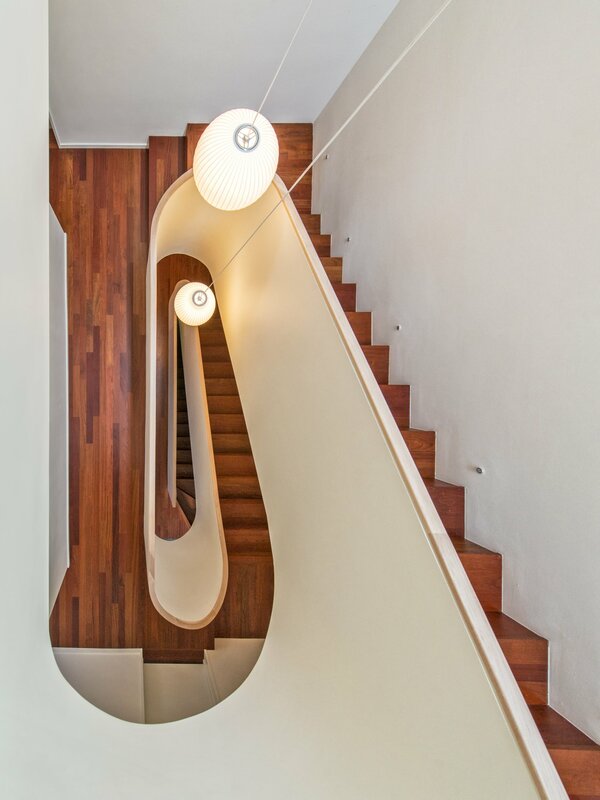 The curves are all true semicircles that progressively tighten as they descend and form a complex geometry as they intersect with both the sloped and flat ceiling plates below each landing. The rear of the house was extended to provide a large eat-in kitchen and family room with a fully operable glazed exterior wall on the ground floor and a master suite above. The previous homeowners had installed a large concrete swimming pool and deck, nearly filling the rear yard. By removing the mass of concrete and replacing it with a simple wood deck and garden, the space opens visually and physically. Even with the enlarged building footprint, the green spaces in this project have been more than doubled. The interior palette was kept quite simple with a Jatoba floor in the living spaces and black slate in the entries and kitchen. These rich colors contrast the crisp white walls and the light woods such as Douglas Fir and Birch that were used in the kitchen and bathroom millwork. 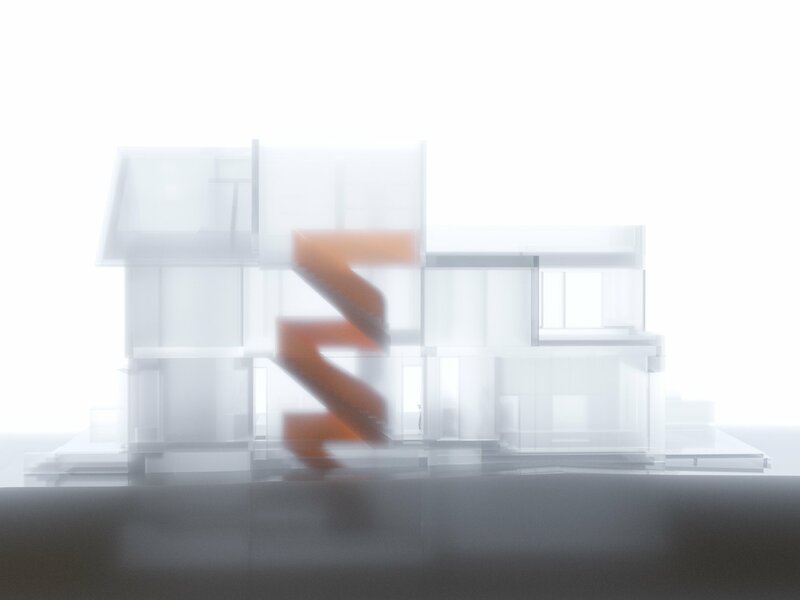 A similar palette exists at the back of the house on the new elevation. Volumetric rooms with large expenses of glass present a modern facade in the same white as the front, but here they are detailed with Sapele windows and trim. This renovation and addition was for a family who endeavored to find a home that would exist seamlessly in a traditional neighborhood, yet exude a decidedly modern presence. They asked for a study of contrasts, not only oppositions in style and form, but also in the color palette, citing a love for the contrast of dark against light.